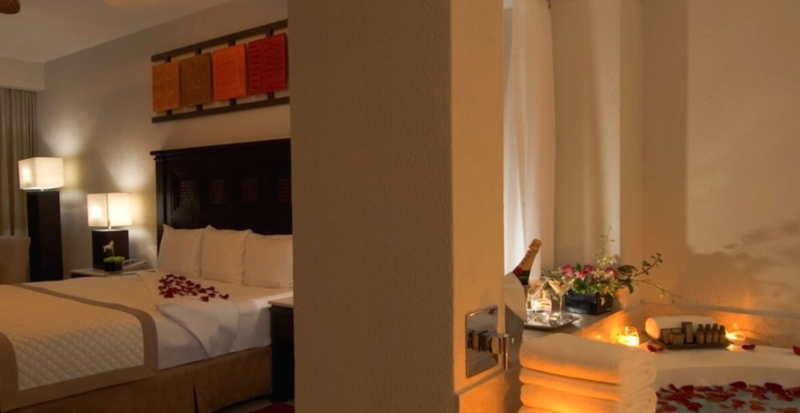 Located smack dab on Medano Beach in Cabo San Lucas, the AAA Four-Diamond Casa Dorada Los Cabos Resort & Spa offers the finest amenities and facilities for groups and exclusive events. A Member of Preferred Hotels & Resorts, Casa Dorada has been created to offer ultimate luxury and comfort through its contemporary style and unpretentious hospitality. Service is of utmost importance to us, and the well-being of each and every guest is a collaborative effort of our entire Casa Dorada team. Casa Dorada brings upscale service and family-friendly features to Cabo San Lucas’ oceanfront. The resort provides visitors a more convenient, yet equally spectacular, alternative to the more remote hotel zone of the Tourist Corridor. Casa Dorada is perfect for couples and groups looking for a bit of class and a party. Your resort is all about amazing service, food and experiences. But you are also only steps from all the beach parties, beach fun, and water activities on Cabo’s famed Medano Beach. 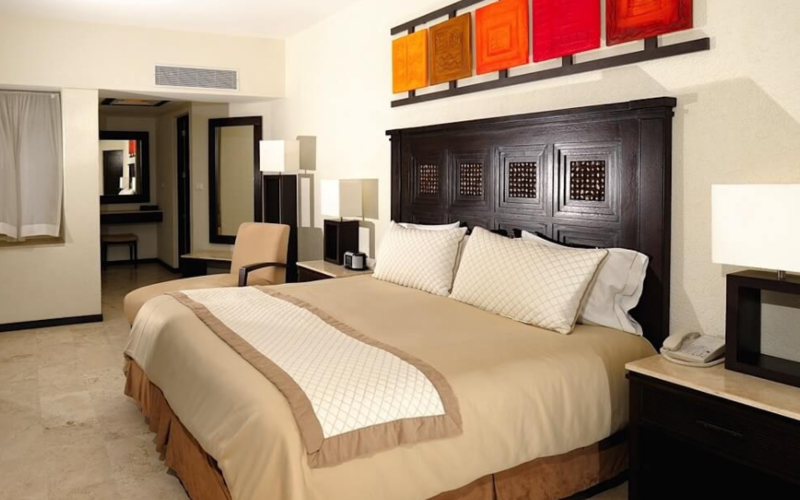 Room rates at Casa Dorada include accommodations only (European Plan. This way, you can either eat in, with choices of five excellent onsite restaurants overlooking Cabo Bay; take advantage of room service relaxing in your suite; or venture out into El Centro in Cabo San Lucas to explore the wide variety of authentic Mexican and other international dining to be found. Ask your LuxLife Vacations Concierge for amazing restaurant options in the area to fit your mood, appetite, style and budget. Casa Dorada Resort is a Beacher’s dream. If you are looking for an amazing resort which has all the beach activities you can dream of at your disposal, then you have found it! From Jet-skiing to parasailing, to splashing in the sparkling turquoise water of the Sea of Cortez, you get all kinds of beach fun at your fingertips. You are also just steps away from all the Medano Beach bars and restaurants. These 665-square-foot one-bedroom accommodations offer spacious living and dining areas, a kitchenette, a pull-out bed — ideal for children — and a master bedroom with a king-size bed. The bedroom opens up to a 220-square-foot terrace with breathtaking ocean views. The spacious bathroom offers the comfort of a shower and bathtub and marble sink. In keeping with Casa Dorada’s soothing, elegant color scheme, the One-Bedroom Suite offers the ideal respite for sophisticated tastes, with exquisite views of the bay and nearly 1,100 feet of interior space. Take in the view from your spacious terrace, and enjoy the ample living and dining areas, a kitchen, a bedroom with king-size bed, and a pull-out bed designed for children. Just steps from the beach, our Two-Bedroom Suites feature 1,850 square feet of luxurious space, including living and dining areas, a kitchen, two bedrooms with a king-size bed and two double beds, a pull-out bed well-suited for children, as well as a grand terrace. Ideal for families, these spacious accommodations also boast two marble bathrooms and a Jacuzzi – adding a touch of opulence – while the unobstructed view of the sea transforms this suite into an experience by itself. Located smack dab on popular El Medano Beach in Cabo San Lucas, close to all the beach bars and restaurants, swimmable beach and water activities; and with a fabulous party venue on the pool deck overlooking the spectacular views of Land’s End and the sparkling waters of the Sea of Cortez.This family friendly resort is walking distance from El Centro for shopping and the nightlife for which Cabo San Lucas is famous. “Casa Dorada Los Cabos Resort & Spa offers five excellent restaurants and bars, all taking advantage of the breathtaking views of El Medano Beach, the Sea of Cortez and Cabo’s iconic Land’s End. Savor authentic Mexican specialties al fresco at 12 Tribes, or a buffet of just caught fish and seafood at Maydan. Belly up to the open air Trattoria & Sushi Bar serving up Italian favourites and fresh sushi and sashimi. Grab a bite or a drink without missing a minute of sun and fun at the Okianus grill and swim-up bar. For evening fun, sports bar and casual pizza and snacks check out The B. The Saltwater Spa at Casa Dorada will pamper you with wraps, scrubs, and facials. Also offering an assortment of therapeutic massages whose names will make you hungry; as you recharge your batteries or prepare for a special night out. Spa pedicures and polish will keep your feet pretty for dipping in the ocean or those barefoot beach walks. Saltwater Salon also offers special hair and makeup styling packages for individuals or entire wedding parties. In addition, guests of Casa Dorada have complementary use of the steam room, sauna and jacuzzi, as well as the gym’s cardio and weight equipment. Los Cabos is proud to offer some of the most scenic and challenging golf courses in the world, designed by famed professional golf architects. Your specialized golf concierge can make all arrangements for you to hit the links at the course(s) of your choice. Check-in/chek-out Time: Check-in 3:00 p.m. Room assignment prior to this time is subject to availability. Check-out12:00 p.m. Any departure after this time is subject to a full day charge. Except during premium stay timing, if a reservation is canceled within 12 days of the local arrival date, the Hotel will charge a cancellation fee equal to one night’s contracted room and tax. No shows will be charged a cancellation fee as though the reservation had not been timely cancelled.